This article is about the municipality. For the greater city with the status of Capital Region, see Brussels-Capital Region. The City of Brussels (French: Ville de Bruxelles [ˈvil də bʀyˈsɛl] or alternatively Bruxelles-Ville [bʀyˈsɛl ˈvil], Dutch: Stad Brussel [s̪t̪ɑt̪ ˈbrʏ.s̪əl̪] or Brussel-Stad) is the largest municipality of the [Brussels-Capital Region]], and the official capital of Belgium. On 1 January 2006, the City of Brussels had a total population of 144,784. The total area is 32.61 km² which gives a population density of 4,440 inhabitants per km². As of 2007, there were approximately 50,000 registered non-Belgians in the City of Brussels. At first, the City of Brussels was simply defined, being the area within the second walls of Brussels, the modern-day small ring. As the city grew, the surrounding villages grew as well, eventually growing into a contiguous city, though the local governments retained control of their area. The construction of Avenue Louise was commissioned in 1847 as a monumental avenue bordered by chestnut trees that would allow easy access to the popular recreational area of the Bois de la Cambre. However, fierce resistance to the project was put up by the town of Ixelles (which was then still separate from Brussels) through whose land the avenue was supposed to run. After years of fruitless negotiations, Brussels finally annexed the narrow band of land needed for the avenue plus the Bois de la Cambre itself in 1864. That decision accounts for the unusual southeastern protrusion of the City of Brussels and for Ixelles being split in two separate parts. The Université Libre de Bruxelles' Solbosch campus is also part of the City of Brussels, partially accounting for the bulge in the southeast end. 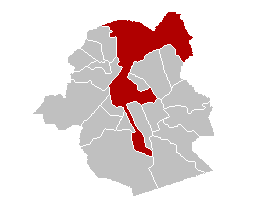 Unlike most of the municipalities in Belgium, the ones located in the Brussels-Capital Region were not merged with others during mergers occurring in 1964, 1970, and 1975. However, several municipalities been merged with the City of Brussels throughout its history including Laeken, Haren, and Neder-Over-Heembeek, which were merged into the City of Brussels in 1921. As in every other Belgian municipality, the City of Brussels is headed by a mayor, which should be confused with neither the Minister-President of the Brussels-Capital Region nor the Governor of Brussels-Capital. According to the Belgian Constitution (Art. 194) the capital of Belgium is the City of Brussels municipality. Arguments that the use of lower case in "ville" and "stad" in Article 194 for "ville de Bruxelles" (French), "stad Brussel" (Dutch) makes a subtle difference and means that Brussels at large as the capital cannot be defended on a legal basis. However, although the City of Brussels is the official capital, the funds delegated by the federation and region for the representative role of the capital are divided among the 19 municipalities and, in practice, national Belgian institutions are indeed located not only in the City of Brussels, although many are, but also in most of the other 18 municipalities of the Brussels-Capital region. The implication is that de facto the entire Region serves as capital, but de jure only the City of Brussels is entitled to the title of capital of Belgium. ^ Picavet, Georges (29 April 2003). "Municipalities (1795-now)". Georges Picavet. http://belgium.rootsweb.ancestry.com/bel/_places/bel_places.html. Retrieved 2009-04-05. ^ "Brussels Capital-Region". Georges Picavet. 4 June 2005. http://belgium.rootsweb.ancestry.com/bel/2bru/index.html. Retrieved 2009-04-05. This page uses content from the English language Wikipedia. The original content was at Brussels. The list of authors can be seen in the page history. As with this Familypedia wiki, the content of Wikipedia is available under the Creative Commons License.